Daniel is an adjunct Professor of international law and human rights at University of Lausanne and Suffolk University Law School (Boston MA). He is also a senior lawyer at the European Court of Human Rights (France). He holds a diploma from the Geneva Graduate Institute for International and Development Studies and a PhD from the University of Lausanne. In 2014, he has been a visiting fellow at Harvard Law School. He is a general editor of the Hague Yearbook of International Law. Daniel Rietiker is a lecturer in public international law at the University of Lausanne (Switzerland) and a senior lawyer at the European Court of Human Rights (Strasbourg, France), where he has been dealing with high profile cases, inter alia, in the field of freedom of expression, international child abductions and cases involving measures against persons suspected of international terrorism. He holds a diploma in international relations from the Geneva Graduate Institute for International and Development Studies (IHEID) and a PhD from the University of Lausanne. In 2014, he has been a visiting fellow at the Human Rights Program of Harvard Law School conducting research on the humanitarian impact of nuclear weapons. 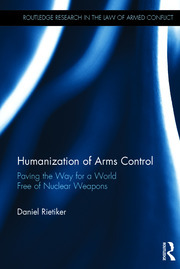 His publications and past lectures cover various topics in the field of human rights and arms control law. He is a general editor of the Hague Yearbook of International Law. He is member of the Adjunct Faculty of Suffolk University Law School since 2014 where he teaches a class on the protection of human rights in Europe. He is also member of the International Law Association (ILA)'s Committee on non-proliferation of nuclear weapons and contemporary international law, and the president of the association of Swiss Lawyers for Nuclear Disarmament. International law, sources of international law, treaty law, human rights law, European Court of Human Rights, arms control, non-proliferation of nuclear weapons, nuclear disarmament, humanitarian law, human security.